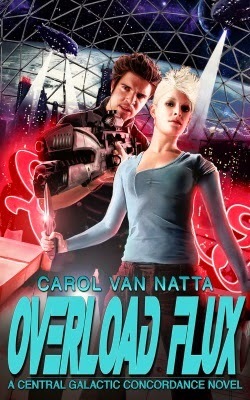 During my call for 2015 science fiction romances, I discovered author Carol Van Natta and her post about Why You Should Read More Science Fiction Romance in 2015. Favorite quote: " SFR offers the best of both worlds — a vision of a futuristic universe where anything can happen, and active characters with heart (and often a laser pistol or two)." Brilliant crime scene investigator Luka Foxe has a problem. His hidden mental talent is out of control, making him barely able to function in the aftermath of violence, and the body count is rising. The convoluted trail leads to a corrupt pharma industry and the possibility of an illegal planet-sized laboratory. Faced with increasing threats, Luka must rely on an enigmatic, lethal woman he just met, but she has enough secrets to drag a ship down from orbit. Mairwen Morganthur hides extraordinary skills under the guise of a dull night-shift guard. The last thing she wants is to provide personal security for a hot-shot investigator, or to be plunged into a murky case involving deaths, murderous mercenaries, sabotage, treachery, and the military covert operations division that would love to discover she’s still alive. Two more lives in a rising death count won’t bother their enemies one bit. Their only hope for survival lies in revealing their dark secrets and, much harder, learning to trust one another. Sounds intriguing! I love me a corporate/medical thriller type of SFR. According to the author's article linked to above, a sequel is planned for 2015.